Remember that incredible Pokémon Go trailer that basically changed our geeky little lives forever? You may also remember that it detailed a ton of features that were notably absent at Pokémon Go’s launch, and for much of the two years that followed. One of the most desired of these features was the ability to trade Pokémon. This has finally been added to Pokémon Go, offering trainers the ability to swap Pokémon to complete their Pokédex. Here’s everything you need to know about trading in Pokémon Go! Trading does not require a specific Friendship level, however there are significant trading benefits earned by increasing your Friendship with a player (more on that below). It’s also important to note that you have to be in a physical proximity to each other—which means no trading with online friends. Finally, you must both be Trainer Level 10. When two Pokémon are traded, they both have a chance to become Lucky Pokémon. Lucky Pokémon feature a new background on their entry and benefit from decreased Stardust costs for Powering Up. The Stardust cost is reduced by 50%, though the Candy cost, typically the real challenge in leveling a Pokémon, remains unchanged. Lucky Pokémon do not gain any special stat changes aside from any obtained based on Friendship Level, nor are there any visual changes to the actual Pokémon. The chance for a Pokémon to become Lucky upon trading is random, but the longer it's been since a Pokémon was originally encountered, the higher its chance of becoming Lucky. Time to lure back all of your friends who stopped playing long ago! 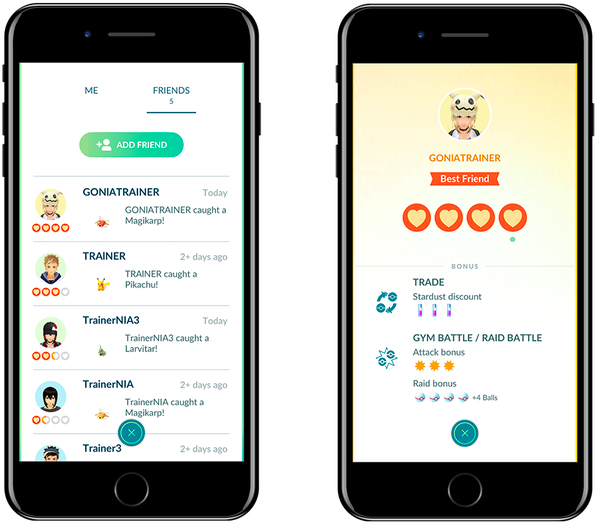 To learn more about raising Friendship Level, check out our complete Pokémon Go Friendship guide. Happy trading!